This is a 3M APC/LC (8 degree angled polished connector, which helps prevent back reflection) to APC/SC SMF duplex patch cable. It is specifically designed to connect to a patch cable with a APC-LC / APC-SC connector, and is not designed to connect to transceivers. This high quality SMF (9/125) patch cable is specifically designed for ethernet, multimedia, or communication applications. 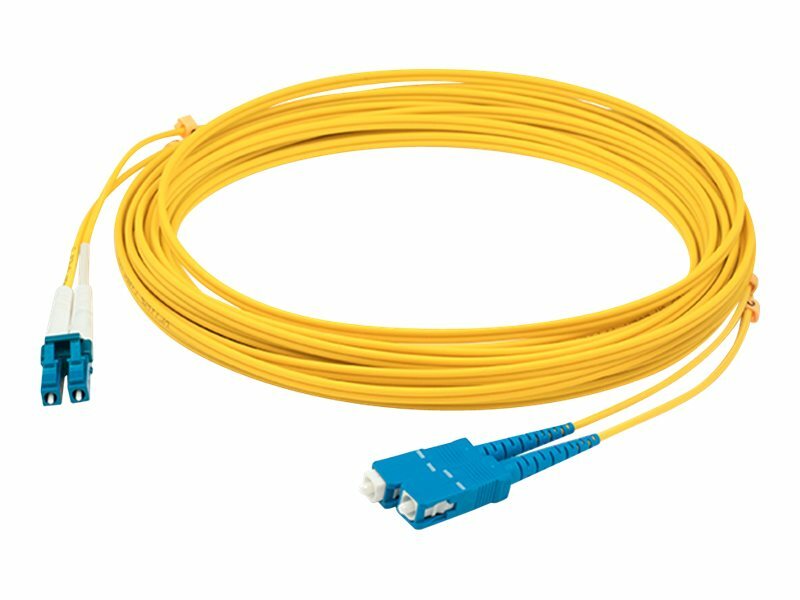 This patch cable is suited for LANs or SANs, and can be purchased with a PVC jacket or low smoke zero halogen (LSZH) jacket. A LSZH jacket protects from toxic and corrosive gases in badly ventilated spaces and other areas where it is most crucial. It also provides the fire protection needed to run within walls and air plenums eliminating the need for conduits. The injection molding process provides each connection greater durability in resisting pulls, strains, and impacts from cabling installs. They provide higher speeds and increased bandwidth compared to conventional twisted-pair copper cable. Each cable is 100% optically tested for insertion loss before you take ownership. Our patch cables are 100% compliant for all of your networking needs. Our products are guaranteed by federal law to not affect or void OEM warranties.